A 2½-foot-long snake slithers out of your car’s air vent as you’re driving down the road. Do you a) jump out of the vehicle while it’s still moving, b) slam on the brakes and abandon your vehicle in the middle of traffic, or c) stay calm and pull off to the side of the road EVEN THOUGH THERE’S A 2½-FOOT-LONG SNAKE AT LARGE IN YOUR CAR? To her credit, northern Virginia resident Lora Goff chose c) earlier this month when she faced that exact scenario inside her Cadillac SRX. After Goff pulled off the road, she called 911. When an animal control officer arrived, the snake was partially out of the vent and entangled in her phone charger’s cord. As the officer tried to snare the snake, it fell all the way out of the vent and went under the front seat. The officer kept looking but couldn’t locate the snake. Since Goff had been out on her lunch break, she had to get back to the office. 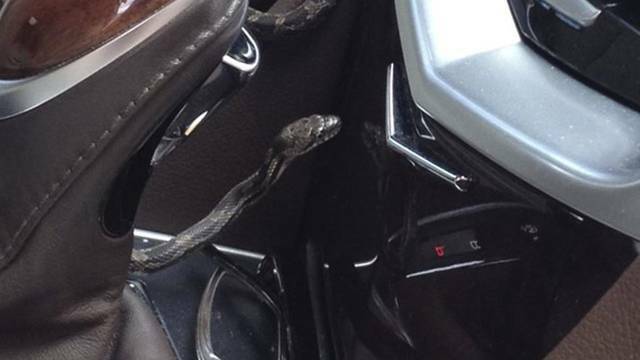 SHE GOT IN HER CAR AND DROVE TO WORK WITH THE 2½-FOOT-LONG SNAKE STILL AT LARGE IN HER CAR. Once back at work, Goff borrowed a co-worker’s vehicle, went out again, and bought some rodent glue traps to put under the seat of her car. Then, at the end of the day, SHE DROVE HOME WITH THE 2½-FOOT-LONG SNAKE STILL AT LARGE IN HER CAR. The next morning, Goff checked her car and found the snake stuck to a glue pad. Her husband was able to remove it, thus ending Goff’s slithery ordeal. After viewing the photos that Goff snapped, experts say the snake was probably a juvenile black rat snake that found its way under her hood overnight while the engine was still warm. 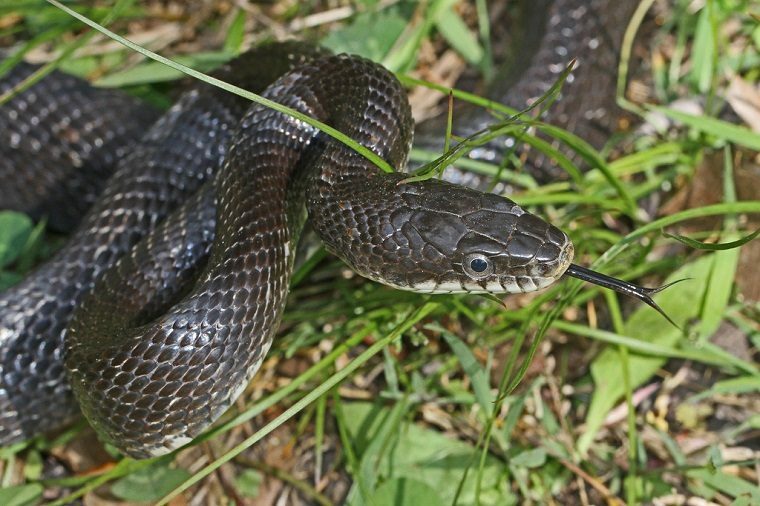 Black rat snakes are not poisonous and generally feed on small rodents and insects. However, they can still be pretty scary when THEY’RE 2½ FEET LONG AND AT LARGE IN YOUR CAR.